Paella has a long history that began with the Moors in the 10th century when they started cultivating rice in Muslim Spain. The dish started out as peasant food – something to fill the bellies of farmers and labourers who would eat it directly from the pan. It was cooked over an open fire and eaten at lunchtime, with each person using their own wooden spoon. The traditional ingredients reflect these humble beginnings: tomatoes, onions, snails and green and white beans. The name paella is most likely derived from the old Valencian word for pan: ‘patella’. Some people argue that it’s from ‘baqiyah’, the Arabic word for leftovers but, like so many things, no one really knows for sure. The home of paella is Valencia on the Eastern coast of Spain. This proximity to the sea is how seafood made it’s way into the dish – cooks would add whatever they had to hand, and on special occasions, rabbit, duck and saffron would be added for extra flavour and colour. 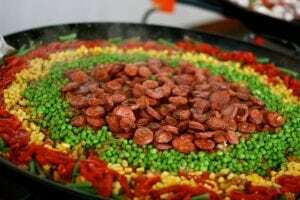 In recent times a argument about what constitutes paella has raged in the media, with Valencian chefs outraged about British recipes that include chorizo. The truth is that there are over 200 iterations of the dish in circulation, with many cooks adding their own twist. Wonder what those original field workers would think about their simple lunch causing such a stir? If you want to adhere to strict Valencian tradition, you need to cook your paella over an open fire fuelled by pine cones and orange and pine branches. This produces an aromatic smoke which infuses the paella. Your guests will then need to eat the paella directly from the pan. Today, paella is a very popular dish in Spain. 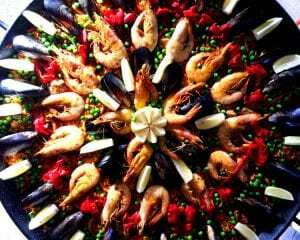 Families congregate to eat paella in restaurants, bodegas (wine bars) and txokos (large dining areas) at the beach or in mountain picnic areas. Giant paellas are the centrepiece of most large celebration. A true Spaniard wouldn’t dream of having a party without paella! 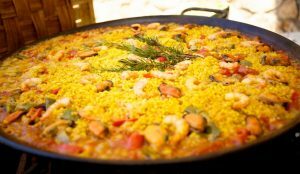 Want to have a crack at a traditional Valencian paella? Here is the recipe that is considered the most authentic. 1.Heat up the paella, add the oil and when it gets quite warm, add the meat (chicken and rabbit, cut into small pieces). 2.Sauté it over low heat until the meat is sealed and golden. 3.The next step is to add the tomatoes (peeled and ground) and vegetables (lima and green beans), maintaining the same heat. 4.Once everything is well fried, add the stock, a sprig of rosemary and heat everything up. 5.Just when it begins to boil, add the rice, the snails, salt and saffron and remove the rosemary. At this moment the fire needs to be at its maximum. 6.When the rice is cooking for about 10 minutes, decrease the heat gradually for at least another ten minutes. 7.Once the paella is done and all the liquid has evaporated, let it stand for a few more minutes covered with aluminium foil, and then it’s ready.